I’ve reached a fitness low. Any doubts I had were eradicated when I detonated during a hard training run last week. It wasn’t supposed to be hard, I didn’t want it be, but I entered into an unspoken race. Four or five kilometres of pushing was too much and I blew within site of home. I could choose to be depressed by the loss of form, but in fact I’m excited. I haven’t been here in a long time. The process I’m going through reminds me of my early days transforming myself from a lazy, desk bound computer programmer into an athlete. I’m a few steps up the ladder, but the principles remain the same. When I tried to run fast I got a swift reminder that I wasn’t ready. Too much, too soon. Training is simple. Stress the body, recover and adapt. That’s it. The challenge is getting the stress right. Sufficient that we adapt well, but not so much that recovery is delayed. We all want to be fitter and faster and equate that to training faster or harder. As stress rises so does recovery time. There’s a point where we have to question the value of working harder: is it inhibiting our overall plan? Timing is key. Sessions that takes multiple days of recover should be held in reserve and used deliberately. At the beginning of training they are entirely inappropriate. If the rest of the week suffered it was too much. Racing in training left me with sore legs and hints of old injuries, the result was reduced running later in the week. The session stressed my body harder than a steady run. Its individual impact was greater, but missing other sessions cost me overall. Current fitness means any training stresses me. It’s true for all new athletes or those who’ve taken time off. Instead of settling into a routine that emphasises developing fitness and basic skills we’re tempted to train like someone at their peak. We shouldn’t completely avoid hard work, just manage its quantity; there’s much to be gained consistently training. 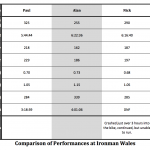 My last post broke down an Ironman to emphasise the elements needing practice in training. Much of that can be too much too soon. Approaching Kona last year I went on long rides containing extended periods at Ironman and Half Ironman pace. They were effective, but hard work. Were I to attempt one now the results wouldn’t be pretty. Riding the distance would be sufficient stress; race intensity would be excessive. What’s relevant is the importance of identifying our specific training requirements. Before we consider race pacing or nutrition we need to be ready to handle it. I won’t jump back in to six hour rides at race intensity. I’ll keep the hard work shorter and the long work easier until I’m ready to merge the two. It can feel slow, it can feel ineffective, but with progression results follow. Coaching poolside the desire to rush is most evident. Triathletes race through their warm up and drills before attempting to smash out the main set. Every length needs to be the fastest yet. The contrast when a more experienced swimmer held up the lane carefully performing each drill was striking. It remained in the main set as he left the fast drillers behind, unable to keep on his feet. A clear instance where going faster is not the answer; drills are about technique not aerobic conditioning. Athletes expect that results come from an endless stream of hard training. It’s more challenging getting someone to hold back than push their limit. If the athlete listens they can focus on their actual limiters and avoid cycles of push and recovery. It may be by improving swim technique or by enabling them to run more overall. It can often reduce their fatigue and help them go harder when it really counts. The solution to faster racing is not always faster training. Going fast remains a temptation. You would think returning from an injury would make me far more careful. The ego is a powerful thing! There’s no harm in short doses, but I’ll save the rest for the summer. At least my little race helped me appreciate where I am now and the work I need to be doing. It’s too soon to be going fast.